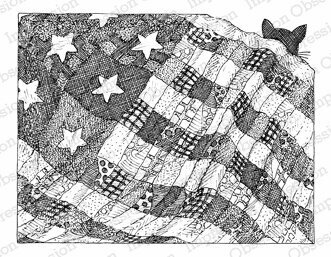 This is a patriotic themed 5.75 x 5.75 inch CLING background stamp featuring the American Flag. A stirring quote from the Star Spangled Banner, this stamp will show your patriotism or appreciation for those serving our country. Image measures approximately 2" X 2". Cling Stamp from Impression Obsession featuring the patriotic phrase "God Bless the USA". America/Patriotic themed Cling Stamp from Impression Obsession featuring the Pledge Of Allegiance. Patriotic cling stamp from Stamping Bella featuring the Statue of Liberty. Cling Stamp from Impression Obsession featuring a Three Cent Postage Stamp with George Washington's portrait. The Hero Arts Destination Washington, DC woodblock stamp features architectural landmarks and fireworks and captures the essence of our nation's capital. Use this stamp to create the perfect card or scrapbook page. Our woodblock stamps originate from sustainably managed forests and are hand cut and assembled by us in the USA. Kelly's New York is a collection of stylish images representing the Big Apple for creating the perfect card or scrapbook page. Our Clear Design Stamps peel off their backing and stick to acrylic blocks for easy positioning. Mix and match the designs, then easily store them for another time. Made by Hero Arts in the USA from genuine photopolymer. Unmatched quality means a crisp impression every time. Created for Hero Arts by designer Kelly Purkey. Clear Stamp from Impression Obsession featuring American 4th of July patriotic banners and phrases. Cling Stamp from Impression Obsession featuring the American flag.